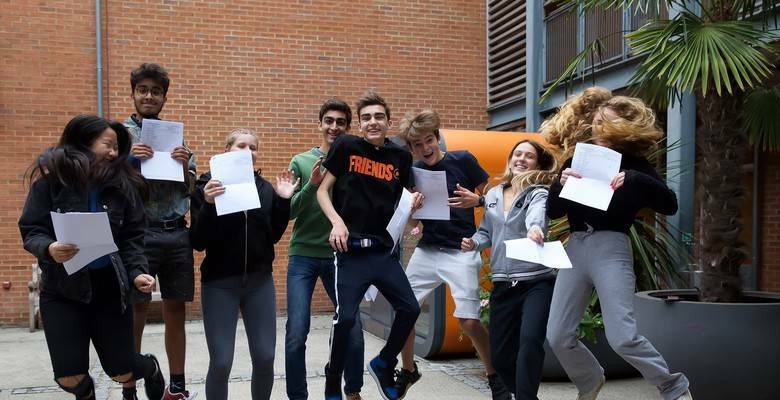 Kingston Grammar School students are once again celebrating an exceptional set of GCSE results with nearly 85% of all grades at A*/A, including grades 7 to 9 in the new numerical grading system. With the newly reformed GCSEs being regarded as somewhat harder than their predecessor qualifications, along with the introduction of the new grade 9 that represents the top of the A* grade, it was especially pleasing to see that 58% of all grades were at the top A*/9/8 level. In fact, over half the students in this year’s GCSE cohort at KGS achieved all A*/9/8 grades across half of all of their subjects, with a handful being amongst the first in the country to gain straight grade 9s in the new GCSEs. There were notable successes for particular subject areas too. In Physics, 83% of all students gained an A* whilst in Philosophy, 90% gained grades 9/8 (equivalent to A*) making a future degree course such as Physics & Philosophy at Cambridge University a distinct possibility for many of this cohort who have demonstrated an aptitude for these distinct yet complementary areas of study. In Philosophy, 60% of all grades were at grade 9, a figure that was matched by Geography; other subjects such as Mathematics were close behind. Many students sat their Mathematics early – in January of this year – and, for the seventh year in a row, 100% gained an A*. Perhaps most pleasing was the demonstration that KGS continues to buck the trend of subjects that are in national decline. Not only are the numbers of students choosing arts, sciences and humanities strong, but modern foreign languages are in rude health too. 70% of students gained A* grades in German, a figure that was closely matched by French and Spanish, and the number of students taking these MFL subjects as well as Italian and Mandarin Chinese is distinctly encouraging for the future. The top student performances came from scholars Felix Adams, Chloe Taylor, and Toby Cole, who each gained 10 A*/9 grades, and Alexander Smolenski who achieved 11 A*/9/8. They were closely followed by Camila Carbajal, Bijan Ghamsari-Esfahani, Suzi Garforth, Madeleine Hayes, Isabel Hepburn, Isabelle James, Isabella Kwiecinski, Lexi North, Harry Torrence, Maia White, Millie Whittle and Coralie Dharmasena, who all gained 10 A*/9/8 grades.